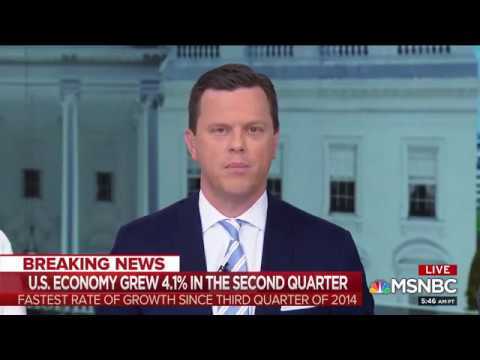 Back in 2016 Obama & the Media and democrats everywhere said the economy and joba will go down and that the US will only hit 1% growth...That was 3 years ago and now in 2019 6 million jobs have been created under Trump, unemployment is at 4% and the Economy is booming....i guess the well educated Obama and biased media misspoke....like always! 1.Job growth in January shattered expectations, with nonfarm payrolls surging by 304,000, the Labor Department says. 2.Economists surveyed by Dow Jones had expected payrolls to rise by 170,000. 3.The unemployment rate ticked higher to 4 percent, a level where it had last been in June, a likely effect of the shutdown, according to the department. February 1, 2019 at 8:06 PMThe U.S. economy blew away expectations for employment growth in January, adding 304,000 jobs amid the government shutdown and ongoing trade turmoil, and easing fears that a deep slowdown — or even a recession — is on its way. January marked the 100th straight month of job gains.The shutdown did not appear to dampen private-sector hiring, but the unemployment rate crept up to 4 percent, the Labor Department said Friday, capturing the furloughed federal employees who temporarily stopped clocking in. Average hourly wages grew at an annual pace of 3.2 percent, with lower-wage workers seeing some of the biggest increases. Where is the economy being destroyed my niggas? Hard to beat a incumbent in 2020 with a MAGA economy. Black mamba economy keeps rolling. Captain bone spurs heading to shutdown 2. Obama first term: He lost 5,000,000/ five millon jobs. Trump first term: He gained 6,000,000/six million jobs. Remember folks obama said these jobs were never coming back and that the economy will never reach 4% unemployment rate. I'm still waiting for the economy to get destroyed like Obama said it would. hehehe where is the destruction of the economy my niggas? Yeah im too am waiting for the economic collapse obama and the liberal media said would come under trump. Here is a video of clip of Obama and democrats and the liberal media all saying in 2016 that the economy won't grow under Trump. .. the reality is the economy is hurting bad because of the monkey action in the oval office., Farmers are hurting , the steel industry and many more down the line..
@visafree, hurting? what alternative universe are you living in? The economy has been graded and given a ( A) grade by the Liberal new york times. When is the economy going down my niggas? Did Obama lied to us my niggas?